The basic idea behind the show ‘Paris, New York, London‘ was a simple one – three cities, three people, each with their own ‘mini show’ of pictures from one of them – which I came up with it sitting in a pub around a year ago with Paul Baldesare. We had just finished a two person show together in the Shoreditch Gallery, a small venue with space for perhaps 35 pictures of an average size for photographs, with some double hanging. It has actually got smaller since I first organised a show there, with one of the three walls (the fourth is a large window) now covered with storage and longer available for hanging. Shoreditch – and particularly Hoxton where the gallery is – is an up and coming area of London, and the Shoreditch Gallery is one of two rooms occupied by a pleasant café in a small square called Hoxton Market, just a few yards from Hoxton Square which now has some pretty heavyweight art galleries. Paris, New York, London is the sixth show I’ve organised in this space on an annual basis. The first three were mixed shows for a now defunct charity group called the London Arts Cafe, including painting, drawing and photography and included work by some fairly well known names in the art world – and we produced a printed catalogue for each of them. And perhaps because they were mixed shows rather than simply photographic shows, I sold pictures at all of them. Since then I’ve organised three purely photographic shows. The first, when the gallery still had three available walls, was English Carnivals, with work by four photographers, myself, Paul Baldesare, Bob Watkins and David Trainer. Last year, down to two walls, I took one and Paul the other with a show ‘Taken in London‘. Three cities for ‘Paris, New York, London‘ is going to be a little of a squeeze. As the third person, Paul and I decided to invite John Benton-Harris to show some of his recent digital work from New York with us. Both Paul and I have known John for some time; Paul was a student of his years ago and I’ve several times written about his work, particularly pictures of the English and St Patricks’s Day – as well as lecturing about him at the FotoArtFestival in Bielsko-Biala in Poland. We liked the work he was now doing with digital particularly on his trips to New York and thought it would be good to have it in the show. Some of the pictures were taken with the Nikon D70 camera I’d done a deal with John over after I’d moved on to a D200 a few years back, though he now has several more digital cameras. I think I originally wanted to call the show ‘London, New York, Paris’ though I’m not sure why I thought that sounded better. Perhaps because like the two previous shows it was going to be a part of PhotoLondon, the East London photography festival. But when I came to register a domain for the web site around the beginning of the year, that name wasn’t available, so it became ‘Paris, New York, London.’ As always with our shows, the actual selection of photographs for the show was left to each person involved, though we agreed that we would have a maximum of 12 pictures each, and that these should form a coherent group of images. I started photographing Paris in 1966, but that year I dropped my camera in the lake at Versailles while getting into a rowing boat with my wife-to-be, and the water did nothing for my holiday snaps. The camera never really recovered either, though it was around 4 years before I could afford to replace it. Four years shooting on film with a shutter speed set on 1/125 that could be anything between around 1/30th and 4 seconds wasn’t a great start to my photography. But in 1970 I splashed out around £30 on a Russian Zenith B with a 50mm f2 lens and really got started in photography. 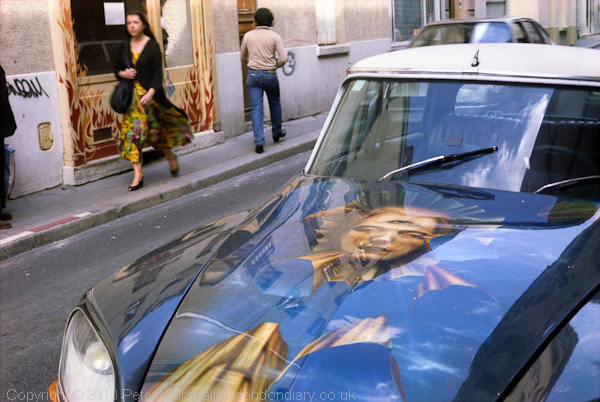 In 1973 I went back to Paris and took some of the pictures that made up my first published magazine portfolio and you can see that work, along with some from later years on my Paris site. In this show I have a dozen colour images from 1988, which were selected from the 65 or so in my latest Blurb book, Photo Paris, a slightly revised version of which with some of the reproduction improved is now available. Direct from Blurb it costs £16.45 + carriage, but at the show party (date to be announced) I’ll have copies at &15. And if you insist I’ll sign them. Photo Paris was taken over a few weeks in August 1988 when I was staying in a flat in Montreuil, just outside the Paris border to the east, one of the settlements around the city that make up the ‘banlieue’ which saw riots a few years ago. The area in which we stayed – like much of Paris – still then had much of a village feeling (unlike many of London’s ‘villages’ which exist only in the minds of estate agents.) Quite a few of the other images are from Belleville and Menilmontant, largely working class districts on the slope at the north-east of the city. It’s an area that the great Willy Ronis made his own through his superb images of the 1950s (and in 2008 I walked his favourite walk.) But back in 1988 I probably hadn’t heard of Ronis and I made my own way around the area, parts of which were being radically modernised, though little trace of this appears in my pictures. I was interested in evoking a past age at least as much as recording the present. Paul Baldesare‘s contribution to the show from London contrasts two decades and two areas, with images from the City of London, including some of those he showed in ‘4 On London‘ in the 1990s with those from his more recent pictures of London’s shopping Mecca around Oxford St.
You can read more about “A taste of the Big Apple” by John Benton-Harris on the Paris, New York, London web site, where there are four of his 12 pictures from the show. I’m particularly pleased that I was able to print 8 of his images for it. Rather than having an opening, we decided to have a show party later in the month, to which all will be welcome – I’ll post the details as soon as they are confirmed. The show opens on Saturday 2 October (although I think we may actually still be putting the work up if you come early in the day) and closes on 29 October. Mon-Fri 8am-6pm, Sat: 10am-4pm. Closed Sun. The Shoreditch Gallery is at the Juggler Cafe in Hoxton Market, which is just to the east of Pitfield St, down either Boot St or Coronet St, a few yards north of Old St. Lots of buses stop near and the nearest tube, Old St, is about 5 minutes walk to the west. This entry was posted on Sunday, September 19th, 2010 at 10:45 pm and is filed under My Own Work, Photographers. You can follow any responses to this entry through the RSS 2.0 feed. You can leave a response, or trackback from your own site.